Dr. C.V. Krishna Reddy is currently Director of Nalla Narsimha Reddy Educational Group of Institutions, Hyderabad, Telangana (India). 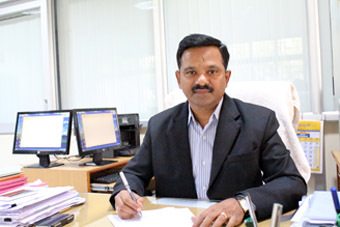 He obtained Bachelor’s Degree in ECE from Nagarjuna University in 1989, Masters from PSG College of Technology, Coimbatore and PhD from JNT University, Hyderabad. He has published and presented about 30 research papers in various national, international journals and conferences related to CMOS Analog and Mixed signal VLSI Design, Embedded Systems and Signal Processing. He is guiding many students pursing PhD and MTech in the above fields. He attended several training programs organized by IITs, NITs and other reputed organizations and professional societies. He is a fellow of IETE and member of IEEE and ISTE. He served as Hony Secretary of IETE Warangal sub-center/center from 2003 to 2009 and as Chairman during 2009-11 of IETE Warangal center. Earlier has worked in reputed organizations like Vellore Institute of Technology, Vellore; Kakatiya Institute of Technology, Warangal; Aurora Group of institutions, Hyderabad in various capacities such as Sr. Lecturer, Assistant professor, professor, Head of the Department and principal for about 23 years. Also served as member and chairman of Board of Studies, Faculty of ECE Kakatiya University. The essence of technical and managerial education pivots around the skill development of the students, which are imparted in the most formidable manner in our campus. The earnest zeal to tower the pinnacles of the reputable fields is fuelled by the unparalleled teaching prowess and state-of-art facilities of ours. With the ardent notion of building effervescent engineering communities, we took the leap in transforming the juvenile minds to intellectual brains. Our efforts to foster the technological advancements on this globe, have earned the respect of the international circles as well. We believe that the world can headway to the coming decades, only by suave management and technological reforms. Our department for managerial studies eludes futuristic financial approach, complemented with rounded management skills – proving to be a virtue for our graduates in the real time environment. However, the financial and technological triumphs are truly cherished only by a salutary society, where the citizens are in pristine health conditions. We play our part in this aspect, by fostering the pharmacy field with the incredible graduates from our stable. Further, the betterment of society relies on the prospective findings in the research works. Effective solutions for diversified issues are derived from them. So, we encourage the students to indulge in the research activities in our campus. Due to these phenomenal works, the skills of our students are enhanced by multiple folds. We thrive for perfection and innovation in these highly valued educational fields, and display astounding efforts in enlightening our students, to assist them in reaching the magnanimous heights in their careers.